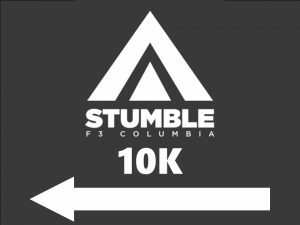 Stumble is humbled (see what I did there) to host a portion of the F3 Columbia Crazy Train for a 10K. 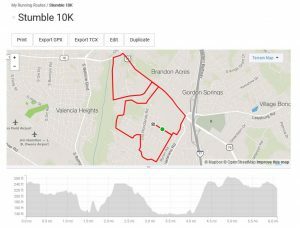 This is a route we run as a qualification periodically. It’s difficult. There are hills. Actually, it’s uphill both ways. You will wonder why you are doing this about mile 3. Martha’s Glen Road to Indian Mound is a series of three subtle and not-so-subtle hills that wind along the edge of the Woodlands Neighborhood above Gills Creek. You get a short reprieve on a long gentle barely downhill downhill until you meet our M.O.M. That’s the ”Mother of Martha” Segment of Garner’s Ferry Road. But the hill somehow keeps going until you pass the VA Hospital to enter the neighborhood again. Enjoy! Please be cautious on Garner’s Ferry Road, because it is a busy road and will require you to cross through a few traffic lights. People may or may not be awake at that hour. STOP if you need to, don’t race a car. Light and reflective clothing is STRONGLY encouraged as well as illumination. The leaderboard. Course record is 39:48 by Hot tub. I am going to attempt to mark the course the night before with signs like this at some turns that may be confusing when you are running full-out in the dark, BUT DO NOT RELY ON THIS ALONE. I can’t guarantee someone won’t take a sign down or it won’t get blown away. Please Study the directions and the course map.